I guess I'm one of the fortunate ones, my memories of Christmas are generally great. With one exception, well, actually three exceptions. The year I came down with the Mumps over Christmas break, the year I got the Measles during Christmas break and the year of the Migraine, I thought my eyes would fall out. Really, those were the exceptions. And somehow I was well enough to help out with making all the goodies we stocked up on before Christmas, and I didn't get sick until after Boxing day, usually. We had some lovely traditions in our family. We would gather together to make cookies, well, it was more of an assembly line, cause I think my mom wanted to get it all done and finished with in one or two days, and I can't blame her for that one. But that's OK, it left me with some great memories. And at the end of it, there were the big green cannisters filled with cookies, Vanille Kranse, Brunkager, Jodekager, Pebernoder and more. I made some Jodekager this year, but ran out of time and energy to make Brunkager, so I guess I'll make them next year. Or maybe just get a wild hare and make them sooner, so I can practice, and you know what they say, practice makes perfect. Then there are the memories of my Dad showing us how to make the hearts we hung on the tree. He was amazing at weaving the paper together, never mind cutting the paper in the first place. I have trouble doing it with the pre-cut shapes, never mind the fancy stuff. Here are some of his examples, and my efforts. I've circled his in pink and yellow, and mine in just yellow. I have some of the older ones put away, and may just put them into a frame and use them as decoration one day. They're faded, and creased and very fragile and the love coming off of them is so intense. I love to just hold them and remember the magical Christmas Eve's when I was a child. So many good/great memories, and pardon me while I share them here. I know that it wasn't all gold and glitter, but the overall memories, well, they were pretty awesome. My brother would make and put up an Advents Wreath in the beginning of December. And we would always have a candle on the table when we ate the evening meal and it would be lit. Then on the eighteenth we would put up the Nissemen, and start decorating. We never put the tree up until the 24th, and the anticipation was incredible. My brother and Dad would bring in the tree, and set it up in the morning. The tree had to come to room temp and the branches relax. Then we got to decorate. Mom would pop in from time to time, she was busy cooking the dinner, and as soon as the tree was decorated, we had to go and help her make the rest of the dinner. The table would be set and the rest of the family would come. The menu was always pretty much the same. To start the meal we would have a small serving of Risengrød, (rice porridge), an almond or two would be hidden in the Risengrød and the lucky recipient would get a prize. Then the main meal would be served. We would have Duck or Goose, potatoes, some veggies, and for dessert, Citron Fromage. And then the torture began. First we had to eat, then the dishes had to be cleared away. Which always took forever.... We would then join hands and circle the tree sing Christmas Carols. Some Danish songs like Højt for træets grønne top (High upon the green tree top) På loftet sidder nissen med sin julegrød (up in the rafters is the elf with his Christmas porridge) and of course Glade jul, dejlige jul (Silent Night). Then there would be a selection of English carols and then, finally, we were allowed to open presents. 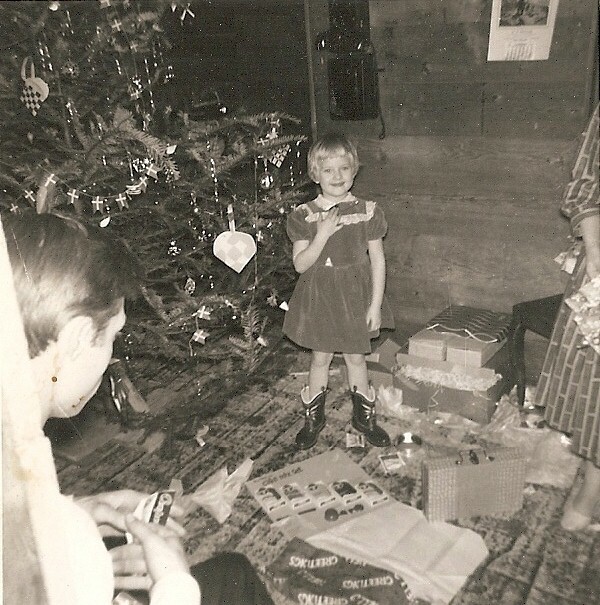 Mom would sit by the tree and call out our names and we would go and get our presents. Somehow the youngest always got their presents first, amazing how that worked. And then after all the presents were opened, and admired, we'd have coffee and some Christmas cookies. And cannot forget one of the most important traditions, we would always save a little Risengrød and at the end of the evening, a bowlful would be taken out to the barn to feed the Nisse, basically you wanted to placate them, so they would not play tricks on you in the coming year. They could be nasty, very nasty. And they love to hide stuff throughout the year. But if you ask nicely and remember to feed them on Christmas Eve, they will bring your stuff back. Always the Risengrød is served in a bowl with a wooden spoon. No metal allowed. So there you have it, a short treatise on my Christmas traditions. Of course they changed just a tad after I got married and moved away. Now we have Prime Rib on Christmas Eve, but I still make Risengrød, and will have fun introducing it to my friends this year. Oh and the prize you get for finding an almond, traditionally it's a marzipan pig. I didn't get one this year, but will make up a fruit basket with marzipan fruit instead. I'm going to leave you with a picture of me and one of the best Christmas Eve's ever!!! I got a pair of red cowboy boots that year. And I wore them til, well, either they fell apart or my feet grew too much. Probably the first Christmas I remember clearly, I also got a baby buggy with a doll and the bed of the buggy had candy. I don't think I played with the doll much, I never got into them, but I'm sure I gave the cats a ride in the buggy, ate the candy and as I said, I wore those boots out.